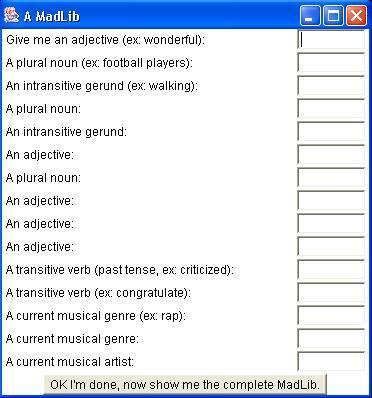 Have you ever done a MadLib? 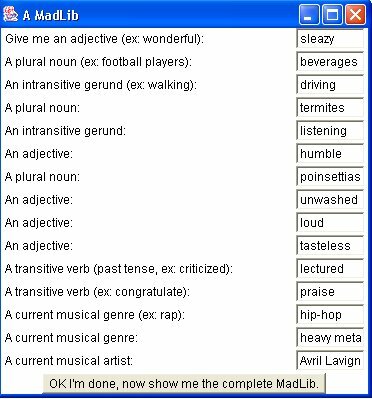 I'll briefly explain what a MadLib is. One person writes or finds a couple of paragraphs and crosses out various words from the text. She then asks the other person to supply the missing words: "Give me a noun," "Give me a present-tense verb," and so on. When all the missing words have been supplied, she reads back the paragraphs using the words that the other person has supplied. Sometimes it's funny. 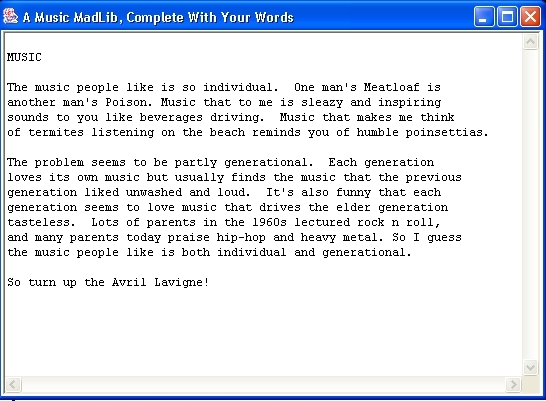 To write the MadLib program, you can use JCreator. To get started, you can download the files below under 'A Starting Point'. Note: You are asked to write your own MadLib, not to re-create mine. Note #2: See the 'Demo' section below to get an idea of how the program runs. The first of the 4 numbers indicates in which row the Button should appear. The method 'buttonClicked' should call the method 'setUpFullMadLib()' which assembles the complete MadLib. If you write the (optional) method 'addCarriageReturns(),' you can call it next. Finally, 'buttonClicked' needs 3 lines similar to the contents of 'main(),' the major differences being that 1) 'buttonClicked' creates a frame of type 'madLibResult', and 2) when you call the constructor 'madLibResult()' send to it the String 'finalStr' as a parameter. This new frame will display the final MadLib. You can use the syntax 'finalStr += ...' on subsequent lines to append text to 'finalStr'. I can give you further hints on writing this method. Inside the 'while' loop, you should also check if the current character in 'finalStr' is "\n" and if it is, set 'counter' to 0. This prevents you from printing lines that are much shorter than the others. Note: If you don't write 'addCarriageReturns(),' you will need to add carriage returns ("\n") to the text you store in the array 'str' so that the MadLib is displayed on several lines. main is written for you. The first line causes an object of type 'madLib' (a frame) to be created, and the next lines determine its size and make it visible. You will need to define a String 'finalStr' and a TextArea 'output'. The constructor is written for you. Here is Javadoc documentation that lists the methods you are responsible for. You can download and run CompletedMadLib.jar to get an idea of how your program will run when it is complete. You can download madLib.java and madLibResult.java as a starting point in writing your program.